This year the bell bottoms are back! They triumphantly returned to the fashion catwalks, and they once again claim to be the main place in the wardrobe of every young person. 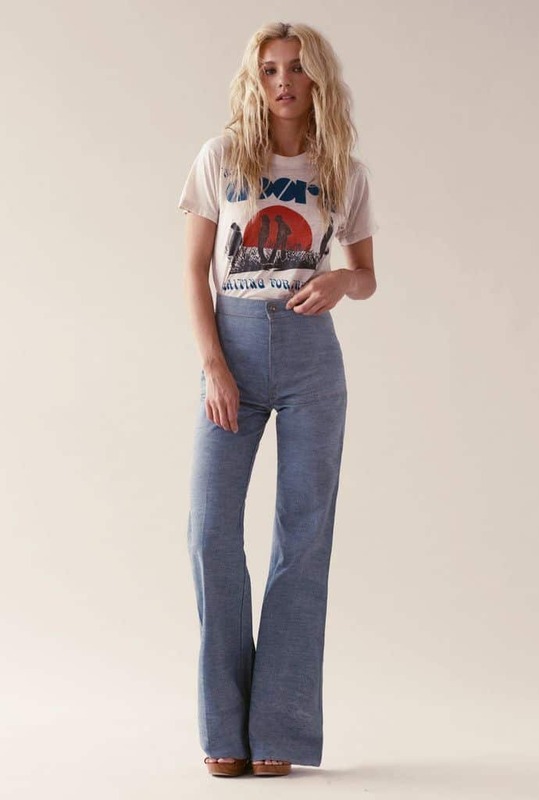 What are bell bottoms and why they are so unique? The first such bell bottom trousers became very popular in 1970, but this year these pants undergone some changes. So, what to wear with bell-bottoms this year? Bell-bottomed trousers ideal for those girls who want to make their legs visually longer and slimmer hips are. 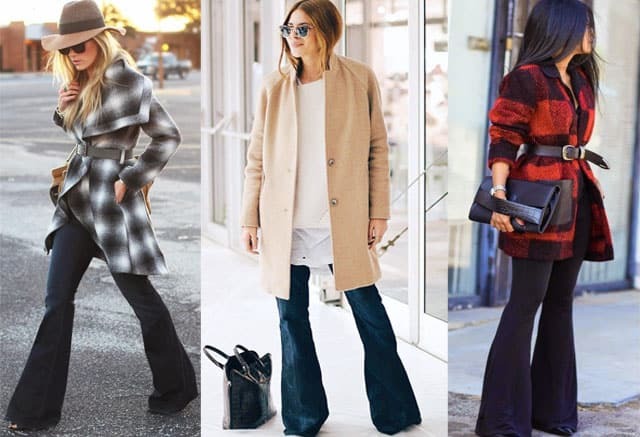 Bell bottoms are very popular among women, as they are considered the most versatile: they are ideally suited to almost all girls, as perfectly highlight the beauty of the hips and shapely legs.It all depends on what you put with it an element of the wardrobe. 1. Bell bottom trousers are perfect for the office, if they wear a classic white shirt and short satin vest. As a result, you have strict and at the same time very stylish image. For a business-like manner best suited black bell-bottoms or neutral shades. Vests desirable to select matching trousers. 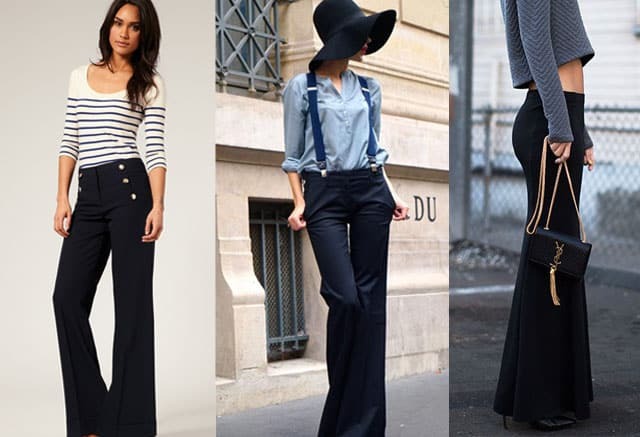 Bell bottoms business style can be worn even with blouses untucked. They will look great when to wear with jackets ensembles to the waist — feminine and neat, decorated with slotted pockets and ruffles, small ruffles at the neck. 3. Bell bottoms are suitable for the same ensemble as usual jeans. Yet they are indispensable in a country style: put them in a checked shirt, roll up sleeves and add a couple of accessories in this style. 4. They also look wonderful with blouses, with a narrow neck and shoulder line and expanding bottom. If you supplement your outfit of high heels, you will look amazing. Most importantly make sure to it that bell-bottom covered the middle of the heel. Bell bottoms are perfectly combined with the style of the hippie. 5. You can add your image by denim jacket, several massive bracelets, loose-fitting linen shirt, a bag with fringes and bright hoop in her hair. 6. 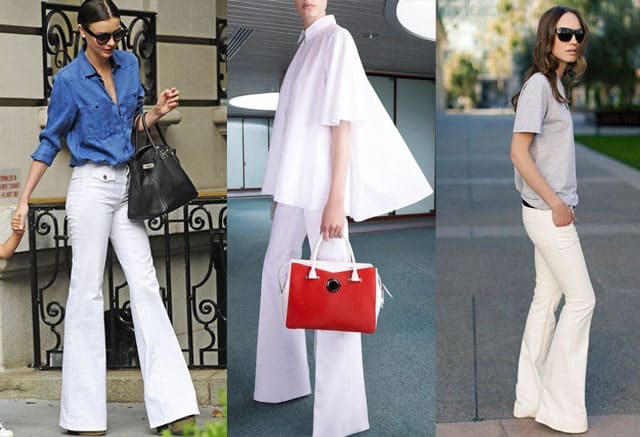 How to wear white bell bottoms? It will be a good acquisition for the summer wardrobe. They can be worn with tops and shirts, and no matter fitting or with a light drapery, both options are good. 7. When you create a casual style you can wear bell bottom jeans with short sweaters, jackets and jumpers, tight turtleneck, short fur coat or a fur vest. 8. In summer you can wear these pants with tight shirts, short tops and colorful blouses. What wear with bell bottoms for the night outfit? 1. In this case, it is desirable to choose long bell-bottoms made ​​of stretch material with glitter. To add a new image of the evening can be pretty high-heeled shoes. 2. As for the top, then the best choice would be a halter top with a plunging neckline triangular shape. In addition, you can put on a man’s hat, big earrings and bright colors red scarf. 3. There is another option, it is a brilliant top of bright color with a smell on the chest and thin straps. 4. Yet it is worth noting that usually don’t wear bell-bottoms with an elongated top, but individual designers liked the combination of these pants with a long outerwear — cloaks, coats. You can wear a long cardigan and a dense jersey. It is best to look with flared trousers fitted jackets and coats, covers the upper part of the thighs. Don’t wear bell-bottom trousers with ballet flats or sports shoes. A sports jackets also would be inappropriate for them. Burgundy bell bottom pants with eggplant knitted sweater – this outfit looks bold, graphic and surprisingly modern.